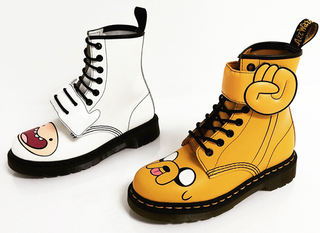 Sure, there are a zillion licensed Finn's hats out there that you could wear to show off your love of Adventure Time, but these new, officially licensed Boots are way cooler than any hat. I mean look at them: it's literal Finns and Jakes for your feet. Interested in purchasing a pair? You can preorder them at Solestruck at $150 a pair, and they'll be available at Dr. Martens stores and online from March 3rd. Marceline boots next please, guys.